UPDATE: Not doing nearly enough to reach my goals. Some days I just don't have the energy to exercise after working an 8 hour day...not sure how others do it while working full-time. Whether we eat out or eat in....I'm the one making the choices of what I'm eating. No one else is forcing me to eat certain foods. Exercise should be a priority and not an afterthought. But enough of the excuses...it's time for me to do what has to be done to reach those goals and stay there. Thanks for taking the time to read my blog. I appreciate all your support. You are steadily loosing so don't be too hard on yourself. You are doing it. Slow and steady wins the race. Just track you food for a few days, this will give you a clue on what needs to be done. You can do this!!! You're right, you CAN do it! 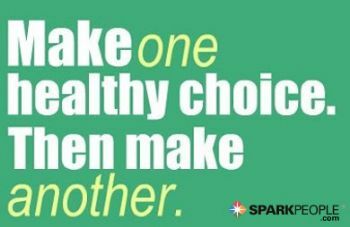 You have a great plan- make one healthy choice, then make another!! You've got this!!! Progress, not perfection - and you are definitely progressing! Great job! You can do it! Just remember to take one day at a time! Go you!